Version 9.4.2 has been released and one of the wonderful additions was Descend Challenges/Quests. Completing these will allow you to access various rushes via multiplayer on a permanent basis. These can be cleared again for an additional stone along with having easy access to these lucrative dungeons. I decided to take my Sarasvati team for a spin in Special Descend Rush – Annihilation due to the easy access to delay cards, ability to override skyfalls, ability to avoid the final floor binds, and being able to deal spectacular damage with a single active. I did not use any inherits and latents are largely irrelevant for Sarasvati in this setting. Everyone is max skill and +297. One nice benefit of using Sarasvati is the lower team cost on herself and the non-GFE subs as they are able to level up significantly faster which can greatly aid in the later floors, especially Linthia. I also forgot how to dual-colour combo solve for some strange reason. In all honesty, that run could have been significantly smoother and I am confident I could min-max it better to reduce the level of risk as there are no surprises as each floor is a fixed spawn (unlike Arena). 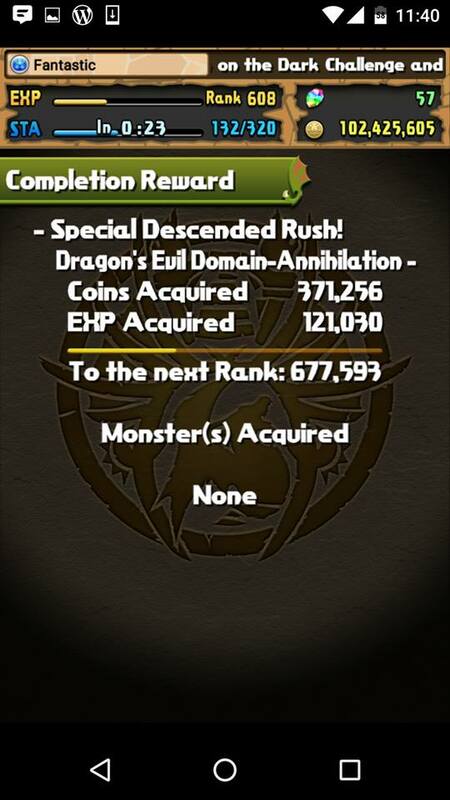 Special Descend Rush – Annihilation is an exciting, albeit challenging dungeon to clear. It is not feasible to run on a regular basis as the drop rate is depressingly low; however, some people may wish to repeatedly play for the massive rank experience it rewards upon completion. Er… Have to fast forward the first 10s or so because I thought it was a troll video at first…. That poison trick vs resolve is really neat. Imma have to remember that. As for the Halloween REM, review is coming soon!